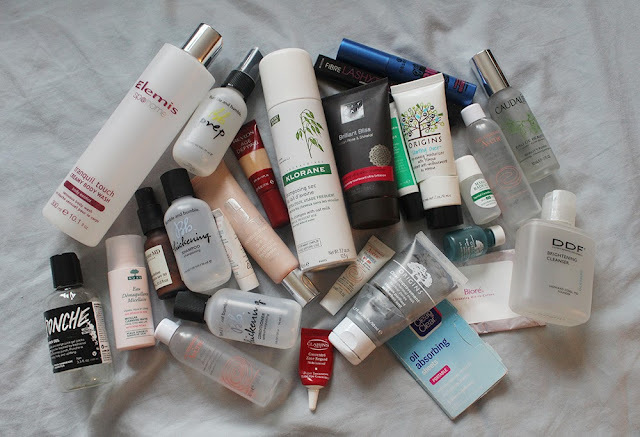 It feels like ages since I last cranked out an empties post but it's only been about two months. 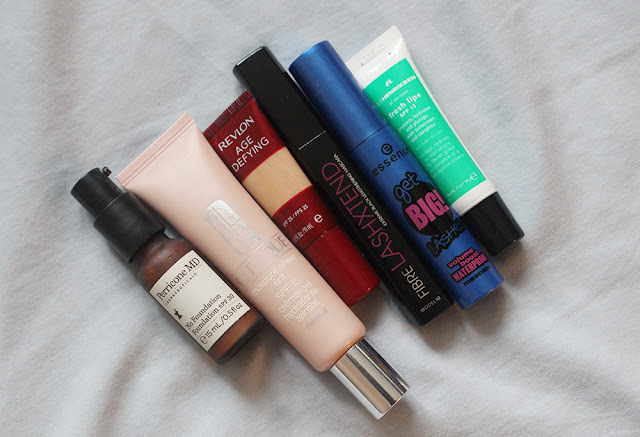 I've got a bunch of finished products to share my thoughts on, as well as some well-used products that have past their expiration date. Let's get on with the mini reviews! First I have a few body care products to share. The Elemis Sp@home Tranquil Touch Creamy Body Wash was one of the items I picked out for free from my Apothica sponsorship. I had high expectations since the brand is highly raved about but while the product was lovely, the scent was incredibly masculine and not pleasant for me. Next up is Lush Ponche Shower Gel, a limited edition product that I got from the Winter Wishes gift set during Christmas. It was my first time trying a shower gel from Lush and while the bright orange color was fun, the scent was not a winner (but not bad). The Origins Starting Over Moisturizer was being given out a few Earth Days ago if you traded in an empty product container. The face moisturizer is a bit too heavy for my oily skin so I used it as a body lotion. It did the trick and had a nice scent but I cannot really comment on its usefulness as a facial product. Moving onto haircare, I finished a bunch of mini trial sizes. I finished the Klorane Dry Shampoo which made it to a favorites post last year. I really enjoy this dry shampoo as it gets the job done well and has a decent scent. I already picked up a back up of this while I was in Paris (it's much cheaper there!). 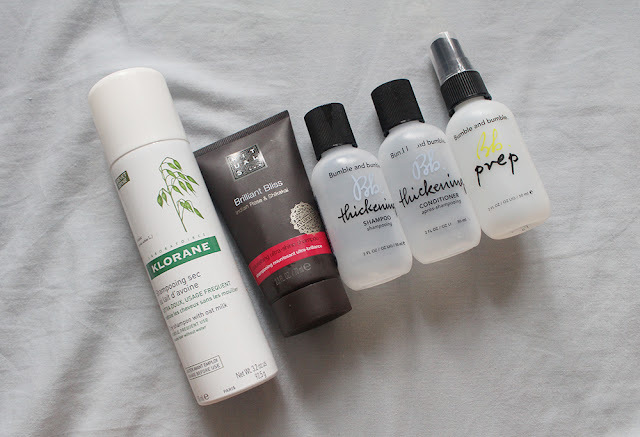 I used up a mini size of the Rituals Brilliant Bliss Shampoo which smells amazing (everything I've tried from the Dutch brand smells fantastic!) and does a fine job of cleansing my hair. I used up the Bumble and Bumble Thickening Shampoo and Conditioner mostly while I was on vacation and they were decent but nothing special. The shampoo does not foam up a whole lot while the conditioner is not thick enough for my liking. Bumble and Bumble Prep is one of the haircare products I've actually really enjoyed using and I feel that it does make a difference in the texture of my hair. It's a nice product to use in the warmer months when hair oils feel a bit too nourishing. Here are a few more skincare goodies that I've finished. The Avene Hydrance Light and UV Riche SPF 20 were both very nice sample moisturizers that conveniently fit into my travel pouches. 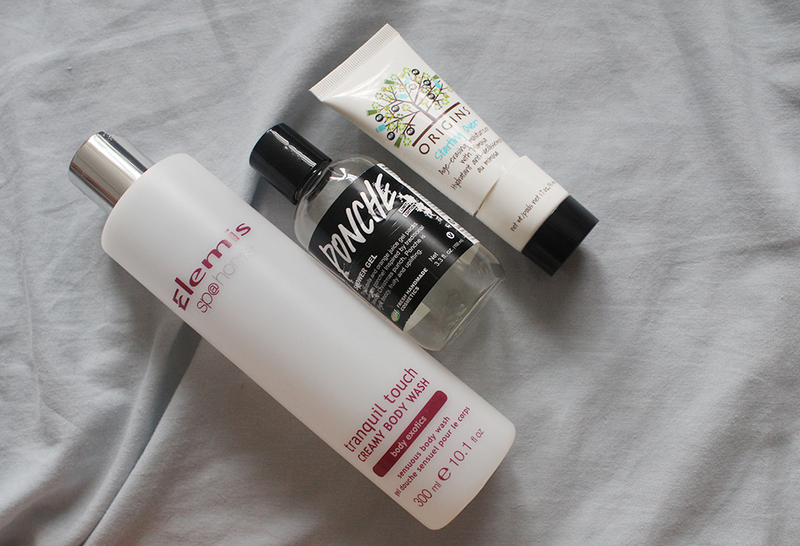 Both moisturizers were non irritating and quite suitable for my oily combination skin. The UV Riche version would be great for those looking for a sunscreen in their moisturizer. I finished the Origins Super Spot Remover which was great at calming and obliterating angry cystic pimples. While the tube is very small, a little goes a long way and is worth the money if large spots are a problem for you. 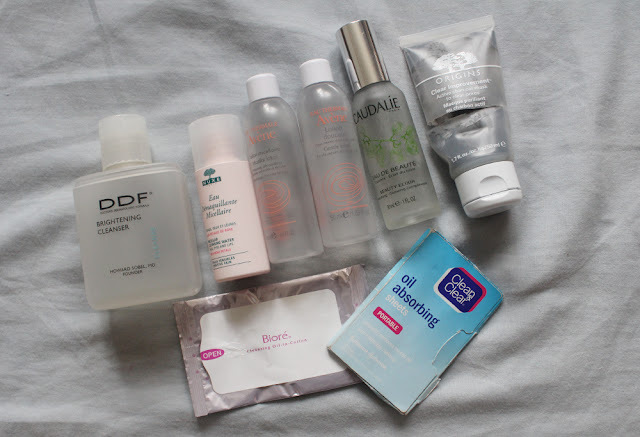 I would repurchase this acne medication but I have some other spot treatments to use up first. The Mario Badescu Special Cucumber Lotion is not good or bad in my books. I don't really get on well with the skincare products from the brand so I would not recommend it. 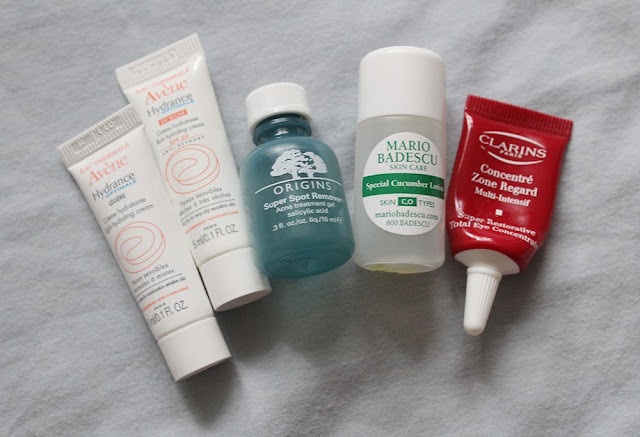 The Clarins Super Restorative Total Eye Concentrate was a teeny tiny sample from the Clarins It Kit set but it lasted a pretty long time since you only need a bit. The eye cream is light yet nicely moisturizing and sinks into the skin very quickly. I just checked the price of the full size and it's a whopping $82 for .53 ounces so I probably won't be rushing out to get this. I have a handful of "finished" makeup products but truthfully most of these are just old products that have past their expiration period. The Perricone MD No Foundation Foundation is too dark for me to wear most of the year so I only used it as a light base on some summer days when I wanted a bit of coverage. I feel that it's overpriced and I decided to toss it when the consistency became lumpy and separated. The Clinique Moisture Sheer Tint (now discontinued) was another one of my summer makeup products because the neutral shade matched my tanned skin tone. It's one of the oldest bases in my collection and I think it started to break me out so I decided to toss it. It's a pretty nice, natural base but not something I would repurchase because I want to try other things. The Revlon Age Defying Concealer (also discontinued) is one of my favorite drugstore concealers but unfortunately not sold anymore. The shade medium is good for my summer skin tone and for a creamy liquid concealer, it had very good coverage. I loved using this concealer for spot concealing when I didn't want to wear any other base makeup. Unfortunately I think the formula went a bit off and caused me to break out a bit. The ModelCo Fibre Lashxtend Mascara was a Birchbox sample and while I didn't fancy it for my eyelashes, it worked nicely at adding volume to my brows. The Essence Get Big! Lashes Waterproof Mascara was one of the cheapest mascaras in Amsterdam so I picked it up with not many expectations. It turns out that it's one of the better volumizing and curling mascaras I have used (although not better than the waterproof Maybelline ones). Finally I'm tossing an Ole Henriksen Fresh Lips SPF 15 Lip Balm because it's past the expiration date and I don't really fancy using a gloss lip balm. I prefer solid lip balms so my hair never gets stuck on my moisturized lips! I'm so glad that I can finally throw out (and recycle) a bunch of this junk because I'm tired of having a massive pile of stuff hanging around my room. I'm also glad that I could finally throw out some expired makeup and make room for newer products. Personally it's a bit hard seeing makeup go when it's not completely used up but it has to be done. Do you regularly toss out old makeup or do you try to salvage what you can?